Water Chestnut grows in many parts of India, Pakistan, Sri Lanka, Indonesia and Southern China. Though native to South and Southeast Asia, water chestnuts are also found in Africa and North America. The plants grow well in ponds, lakes and even shallow low streams. 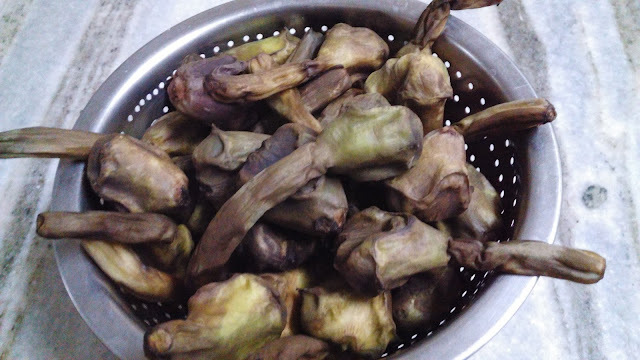 Harvested between October and December, water chestnuts are valued in traditional systems of medicine, such as Ayurveda, for their cooling and astringent properties. They are reputed to reduce heartburn, fatigue and inflammation and are also useful in other blood disorders, urinary tract infections, bad breaths, toothaches and dehydration. So just chomp on a water chestnut. Be a little careful - the plant grows in stagnant ponds, so water chestnut fruits should be washed well before peeling. 1. Peel and cut water chestnut and potato. Take some oil in a pan, add asafoetida, cumin seeds, salt and powdered turmeric, chili and coriander powder. 3. Cover and cook till soft. 4. Squeeze a lemon and garnish with coriander leaves (optional).